World Photos by Madeline Steege More than 1,000 students and faculty filled the auditorium at Marshfield High School on Thursday morning to hear Patrick J. Reynolds, right, talk about teenagers smoking and how best to quit. Reynolds is the grandson of R.J. Reynolds, founder of Reynolds Tobacco Company, the nation’s largest cigarette maker. Every war has its share of high stakes, devious strategy and espionage. According to Patrick Reynolds, the war against tobacco is no different. Reynolds' grandfather was the infamous tobacco industry tycoon R.J. Reynolds, who founded the RJ Reynolds Tobacco Company, which produces Camel, Salem-Winston and other cigarette brands. Now the grandson has established his own organization - The Foundation for a Smokefree America. The well-known anti-smoking advocate addressed more than 1,500 Coos Bay students last week, encouraging kids at Sunset Middle School and Marshfield High School, not to smoke. The American Lung Association gave Oregon a failing grade this year, for prevention programs and regulating youth access to tobacco. Reynolds advocates the state increase spending on prevention programs. According to www.smokefree.org, states that follow the U.S. Center for Disease Control and Prevention recommendations for funding tobacco prevention, such as Florida, California, Mississippi and Maine, have seen a 50-percent reduction in smoking by middle school students, and a 35-percent reduction in teen smoking. The Marshfield auditorium was filled with students and staff, the rafters buzzing with more than a thousand conversations. Reynolds bonded with the audience immediately, merging the prestigious history of his family with the reckless truth of his own upbringing and a few skeletons in the Reynolds family closet. Reynolds said he never knew his father, Richard Joshua Reynolds, Jr., as his parents divorced in his formative years. After watching his father and older brother, R.J. Reynolds III, die from smoking-related emphysema, Reynolds said he turned his back on the tobacco industry and his heritage - to fight the influence of smoking in America. Despite some commotion in corners of the auditorium throughout the assembly, the energy in the room was focused squarely on Reynolds. But it was when he asked how many students are living without a father in the home, that he really connected with the students. 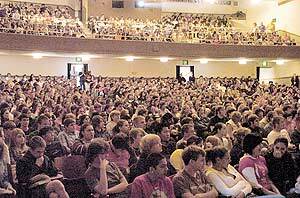 In a hall built for more than 1,100 students, more than 60 percent of the teens raised a hand in the air. Using his own experience as a child from a broken home, a teenager and later a man, disillusioned by the addictive and dangerous qualities of tobacco, Reynolds swept into the meat of his discussion: the risks, consequences and underhanded tactics of smoking and tobacco companies. “Sixty percent of all smokers start before the age of 14, and 90 percent become addicted before reaching 19,” he said. “After 19, hardly anyone starts to smoke. That's why it's so important to reach the young early, and empower them to stay smoke free. For about an hour, Reynolds encouraged students to stay in touch with their true feelings about smoking and tobacco advertisements targeted to youth. He led a demonstration to help teens ask parents, siblings or friends to stop smoking, and discussed how difficult it is for most smokers and tobacco users to quit. “Most tobacco users try and fail, only to try again and fail. It takes an average of 17 years for smokers to quit,” he said. The audience was periodically restless, but when Reynolds displayed a photo of 17-year-old Sean Marsee, an American student who died at the age of 19 from chewing tobacco, the auditorium fell silent. No feet shuffled, no hushed voices spoke and silence reigned over more than 1,100 students. According to Reynolds, Marsee was an award-winning track star in Oklahoma, who started chewing tobacco, or “dipping,” in his teens. A local hero and well-known athlete, Marsee tried to give up the tobacco, but couldn't. After a year of dipping he discovered a cancerous sore the size of a half-dollar on his tongue. The audience seemed to be holding its collective breath as students solemnly listened to Marsee's story, shocked into silence by by the gruesome tale. The cancer spread down Marsee's jaw and into his neck muscles. He had several operations that left him disfigured, Reynolds said, switching the photograph to a very changed young man, hooked to various machines. The hall was filled with a low rumble and quiet gasps as students saw Marsee's deformed face. And no matter whether Reynolds said another word, he had made his point. “Not long after that, Sean expressed a simple affirmation of his Christian faith, and died - sad, disfigured and in terrible, unspeakable pain,” he said, his voice hushed in the silent hall. Student voices filled the hall moments later as teens headed to the cafeteria or to their next class - while others, undoubtedly, left campus to smoke. Marshfield Dean of Students Gael Berhow said students from the Harding Learning Center were specifically invited to the assembly, as more than half smoke. Some of the students were loud and disruptive in the back of the hall, she said, but no one was removed. “They weren't ready for this message, but I wish they could have really heard this,” she said. Other students were more receptive to Reynolds' passionate plea. Emily Miller, 16, said the assembly didn't change her mind about smoking, since she doesn't smoke, but she hoped it affected some of her friends who do. As a cheerleader, Miller said she didn't have a lot of breath to spare puffing on a cigarette. According to Reynolds, the Marshfield audience was very receptive and energetic. He said he was very encouraged by the interaction from students, but it's difficult to gauge the effectiveness of a single assembly. For more information on the smokefree movement, those interested can go to www.anti-smoking.org.